I love this blog because I have a chance to bring (hopefully!) relevant and useful topics based on a snapshot of what is going on in schools every day! Today, we’re going to tackle subtraction with regrouping. The beginning of third grade, in my opinion can feel a bit skewed. Many of the new math series start the third grade year with a multiplication unit, then go into an addition/subtraction place value unit, then swing back around to multiplication. 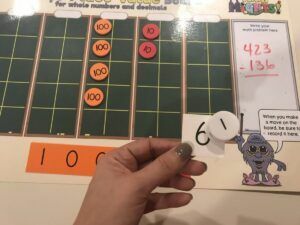 Multiplication is new, it’s exciting for kids, and if they can start picking up and memorizing some of the patterns like the tens, fives, and twos, it can look like they’re doing well! However, as you get further into the year, you might start to ask yourself Why am I doing multiplication when many of my students are coming in as second graders and don’t even have a solid foundation of number sense in addition, subtraction, and place value?? 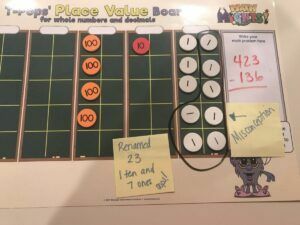 As we’ve been reverse coaching in some of our M³ project schools that are well into implementation, many teachers have been asking themselves that very question as they get to subtraction with regrouping and the kids just don’t get it. When I hear this, I often go back and look at the second grade programs that are taught to see how solidified subtraction with regrouping was by the end of second grade. 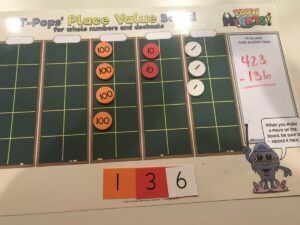 In my opinion, it would be great if kids could learn the idea of the distance between two numbers in second grade and start to really understand the three ways plus the traditional in third grade, even though it probably won’t be completely mastered at that point even though it’s part of the standards. Developmentally, kids need to understand what subtraction really means. If we teach subtraction traditionally right away, it doesn’t lead to the development of number sense. In fact, kids tend to pick up the traditional method pretty quickly because it is a nice fast, easy procedure, even it it is with a concept they really don’t understand. In second grade, their numeracy is still developing into a number sense, but not fast enough to be able to learn that traditional method. For a third grade teacher, subtraction with regrouping can sometimes feel like a nightmare. I really love our coaching because it’s so customized. Once schools identify the skills they want to improve, we can begin reverse coaching. Let’s be honest, with all the things that teachers have going on in schools today, it almost feels like everyone is out to catch you doing something wrong. Our plan for coaching is to create relationships and an environment where teachers can let their guard down. We’re not there evaluating the teachers, but to be able to help them on the job with the things they are really struggling with in the classroom. As you think about coaching, don’t picture me in the back of the classroom with a clipboard taking notes on the teacher! I’m constantly going around to the students and questioning them, asking what they’re thinking. My goal isn’t to correct kids, just get some perspective. “I saw that you took the discs and moved them this way, why did you do that?” “Do you think you’re correct or not?” I’m trying to observe and see what misconceptions they may have. In the position of a coach, you really get a different perspective of the class because you can watch how something is being taught where, if you’re the teacher at the front of the room, it’s often hard to see what students’ misconceptions. This past week, the third-grade teachers I was going to visit said their students were really struggling with subtraction with regrouping. They were using the manipulatives – the place value mat and the discs – but the kids still weren’t getting it. Normally, we have a substitute that follows us around the building on the days we do reverse coaching. We don’t usually need the sub until the reflection time after I’ve been in the classroom with the teacher so we can debrief. The substitute teacher for this particular school I was going to was used in a very unique and efficient way. In this case, the principal had the substitute to go the other third grade room so that both third-grade teachers were in one classroom observing each other while I was there. What an opportunity! To be able to peek into another classroom and observe another teacher that is teaching the same skills in a lesson you’re also teaching, being able to see it from the perspective of a student – amazing! One of the most profound things we discovered through this experience was looking at the way the manipulatives were being used and why it was causing so much confusion for students. When the teacher was passing out the materials, I noticed that she was only passing out the place value discs. I wanted to observe to see how this lesson would transpire with students using only the discs. Here’s what we saw. Let’s take the problem 423-136. They built the number 423 on the place value mat with the discs. Knowing they needed to take 136 away from 423, they started in the ones column and realized they couldn’t take six away from three. They needed to regroup/rename the discs so they could actually subtract. Many students took a ten and were going to “cash it in” for ten ones. However, with the three ones already existing in the ones column, they actually only “cashed in” seven. They were left with 7+3=10 instead of 13 ones. In the first class, we watched the third grade students subtracting with just the discs for both minuend and subtrahend, and there was a lot of confusion. Kids were not connecting what they were doing to the actual algorithm. In the second third grade classroom, we were able to co-teach and introduce with the student how to bring the strips into the lesson. With addition, we do like to use the place value discs because they combine easily. 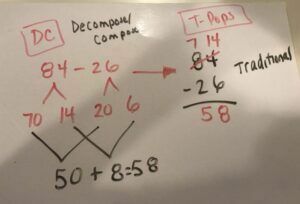 However, with subtraction, students have a really hard time with this concept using discs for both the minuend (the first number) and the subtrahend (the second number). We want to try to refrain from saying that the minuend is the larger number and the subtrahend is the smaller number because I was just working with my 7th grader and she does sometimes subtract when the first number is actually smaller! Typically, when we are subtracting, we build the minuend with the place value discs and we build the subtrahend with the place value strips so students can actually see what’s happening in the regrouping process. Using the strips as the subtrahend helps kids understand what are they taking away. To do the problem correctly, we would start with building the 423 on mat using the discs. To take away 136, we would start by picking up the ones from the ones column and putting them on the strip below that column. Students would realize that they don’t have enough to take away all six. Then, they would leave the three discs on top of the six strip so they were off the mat, and then regroup/rename by trading one ten for ten ones and transferring those ten ones to the now-empty ones column. Students could then see that they’re renaming it to thirteen ones and can then continue with the rest of the problem. 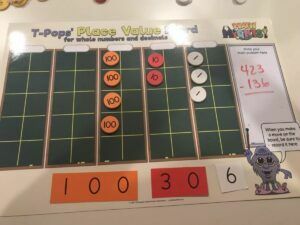 When you’re on the T-Pops place value mat, students can map out what’s happening in the algorithm as they’re combining discs. Every time students make a move on their mat, they’re also making a move on their board. It’s really important to make sure that kids are connecting what they’re doing through CPA – the concrete the pictorial AND the abstract. The reflection piece might be the best part of our coaching. We were able to shift the substitute around at the school I was working so, while the two third-grade teachers observed each other, they each had their own reflection time with me. That day, one of the things that came out of this reflection time was kids’ number sense. Are they really understanding the practice and are they really developmentally ready for this if they’re having misconception with renaming numbers? So we kind of backed up a bit. In the developmental sequence of a child understanding the traditional method of subtraction, decomposing and composing with D.C. must come first (we’re starting to put some of the final touches on our Math Mights subtraction strategies poster – due out by January!). We have to help kids be comfortable renaming numbers. In the traditional way, before we were molding our math mindsets, if we start with 423, we might have to “go next door” when we realize we can’t subtract six from three. We “borrow” one, change the two to a one, and bring the one over to make a thirteen. Think about the way we said that. It doesn’t make sense! If I borrow your jacket for recess, you want it back! Since I never regroup the numbers the way they were, “borrowing” is not an accurate description of what we did! This helps when we’re looking at partial sums with 84-26. If we broke the eighty and the four apart, broke the twenty and six apart, then tried to subtract the six from the four, we’d get a negative number. 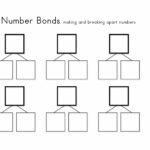 This is super confusing for kids, but flexibility in renaming will help prep students for a better understanding of the traditional method with subtraction. D.C.’s strategy, which is taught before using the traditional method, is to decompose the number, smash it, and back it up a decade or sometimes rename the number. So we could actually smash 84 into 70 and 14 and keeping 26 as 20 and 6, then it subtracts much easier. This is truly what is happening in the traditional method. This example here I have written it horizontally the way you might see it with D.C., but I’ve also matched it up to the traditional method and what’s happening with the place value discs and strips. This class really understands how to use D.C. They do an amazing job using him with addition, but we want to help kids relate it to subtraction. In the reflection with the teachers, we discussed that it would be developmentally appropriate to do some number talks for the next couple of weeks, helping students more fully understand the D.C. strategy as it applies to subtraction. He’s still smashing numbers, but instead of trying to get a decade number, he’s smashing so he doesn’t have to have a regroup. He wants to see what is the way that I can get to what I’m understanding with renaming the number. 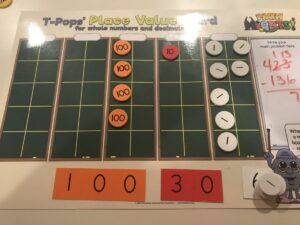 If you’re in a second- through fifth-grade classroom, we highly recommend that you have the T-Pops place value mat and the discs and the strips. They are truly essential! I could not, for myself, ever imagine teaching those grades and the concepts that we have to teach (regardless of what the book says) without them. I know for a fact that kids aren’t going to understand this the first time around and the misconceptions that we see in second and third graders happen in lots of schools and the same misconception comes up when kids are learning subtraction with decimals, so we want to have those decimal strips. Not sure where to start? 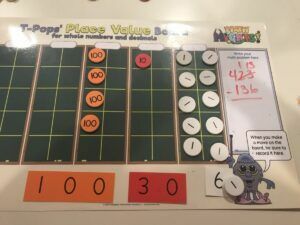 Build yourself a mini kit – five T-Pops place value mats, two or three bags of place value discs and a set of 10 place value strips will be a great start! Everything we’ve talked about today could be done with guided small group. 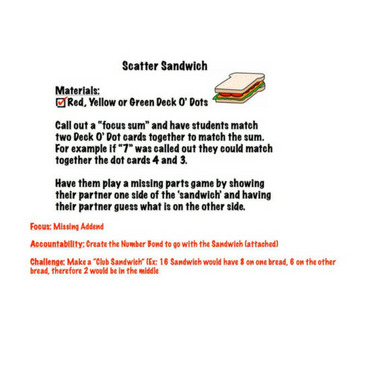 These activity cards and accountability sheets are designed to accompany the Deck o Dots and be used during the Math with Someone rotation of Math Workshop.